Truozzy`s Hand In Hand "Missy Veteran Of Veterans 3 in Gala Show! Judged by Michael Leonard (Ireland), Leni Finne (Finland) Luis Pinto Teixeira (Portugal). Thank you to the judges! Truozzy`s Hand In Hand "Missy" BIS 1 veteran and BOB. Truozzy`s Bee Bee "BiBi" ( Armirelly Funny Business x Truozzy`s Off-Spring) debuted in baby class and was BIS 4 baby. Congrats and thank you to breeder ! Thank you to the judge! Photos from Kaja Lillemets - aitäh! 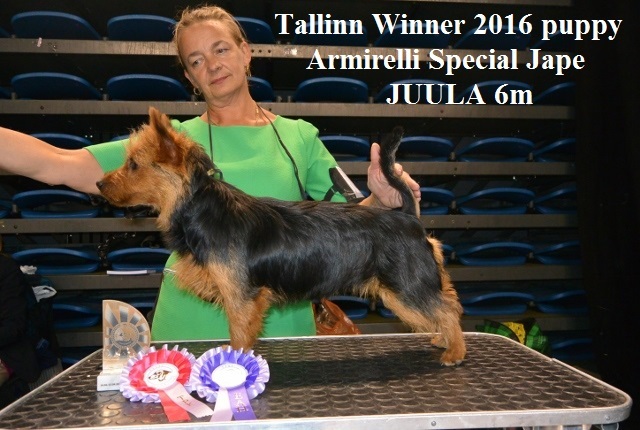 Armirelli team in "Baltic Winner 2016" show in Riga: Armirelli Special Jape „Juula“ BALTJW16, Bluepepper`s Doc "Rafa" BALTJW16, Truozzy`s Hand In Hand „Missy“ BALTVetW16. Was great to meet Anne Moilanen with Armirelli Funny Business „Wiuhti“ - resCACIB, BB2. Thank you my good friends for this trip! Thank you judge Ramune Kazlauskaite from Lithuania! Suur tänu kaasosalistele: Margot, Ingrid, Anne, Katrin, Ingrid, Oksana, Mare! Armirelli Spitting Image "Siina" - CAC CACIB BIG3 at Harstad International, Norway with Marjo Ahola. Congratulations and thank you! 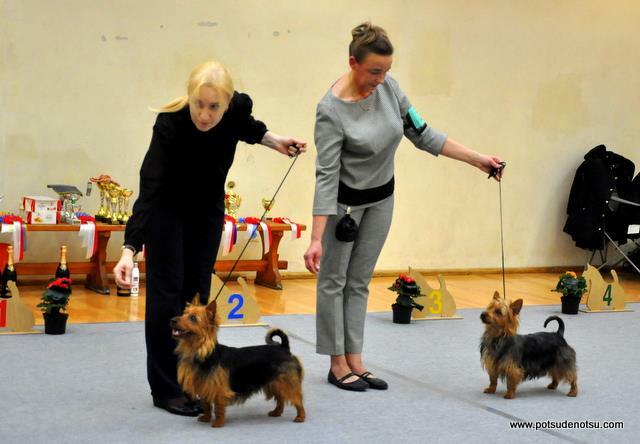 Terrier Show in Riga, judge Magdalena Kozlowska from Poland. Armirelli Special Jape "Juula" JBOB LVJCH BALTJCH BIS jun 5! Bluepepper`s Doc Rafa" BOB puppy BIS puppy 5! Congratulations and thank you to owners, co-owners and Margot for help! 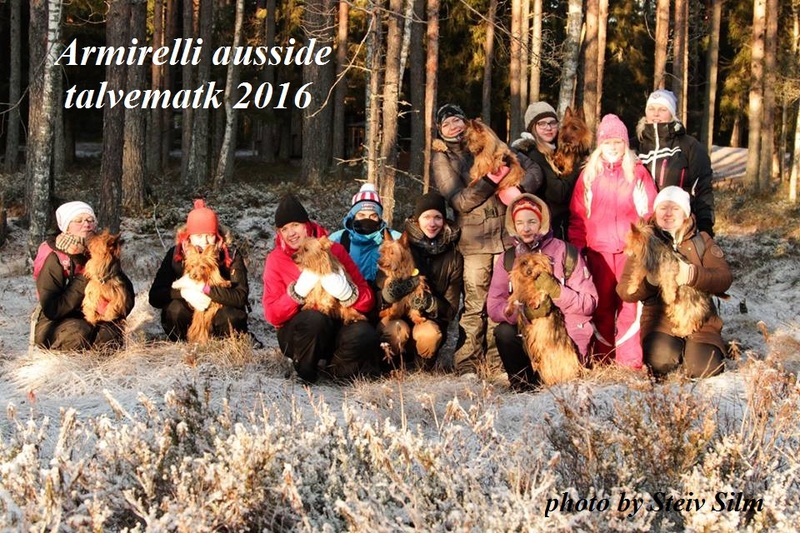 Armirelli team had a great trip to Norway. Armirelli Hot Date „Janis“, owned and handled by Ingrid Sats, CAC CACIB NOCH. Congratulations and thanks, Ingrid! 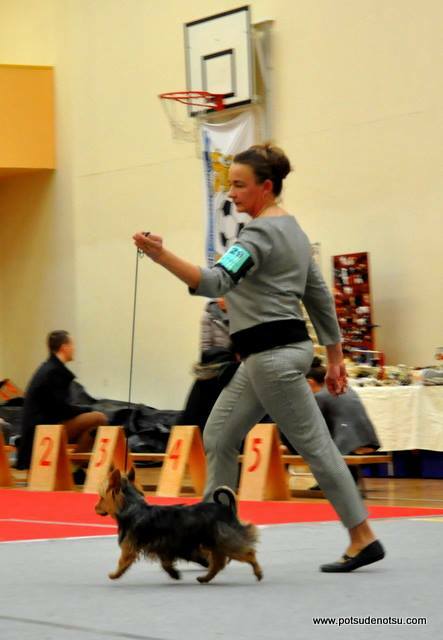 Missy ex, vet cl 1 and Tralla ex ch cl 1. Judge Andrzej Kazmierski from Poland. 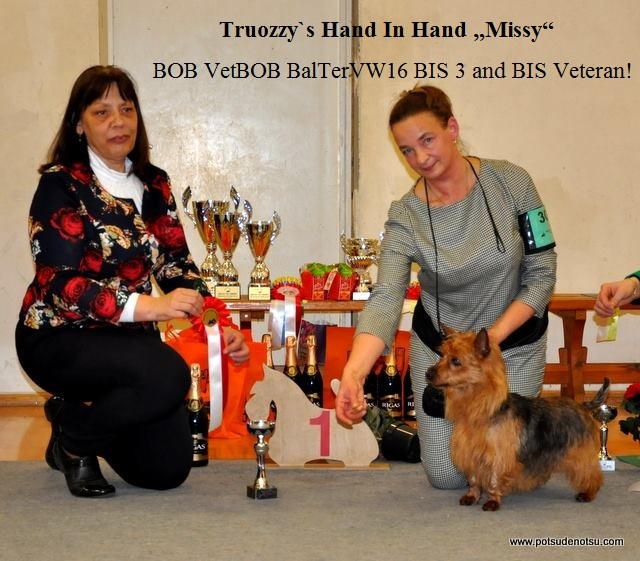 Truozzy`s Hand In Hand „Missy“ BOB Veteran, BOB, BIS 1 Veteran and Best In Show! Bluepepper`s Doc "Rafa" BOB puppy BIS 3 puppy! Armirelli Keep Busy „Hipi“ BOB Baby BIS Baby 4! (co-owner/handler Anneli Tammik). Armirelli Special Jape „Juula“ BOB junior JCAC ESTJCH. Armirelli In Good Hands „Henna“ BB3. Great thank you to the judge, co-owners and handlers. Photos Katrin Esken. Ingrid ja Janis (Armirelli Hot Date) debüteerisid edukalt A1 klassis: kaks esikohta ja üks teine koht mini klassis. Kena algus ja lusti edaspidiseks! 21.08. Armirelli Too Hot To Handle "Tuuli" CACIB BOB. Judge Boris Chapiro, France. Both days Armirelli Special Jape „Juula“ was BOB Junior and took 2 JCAC. 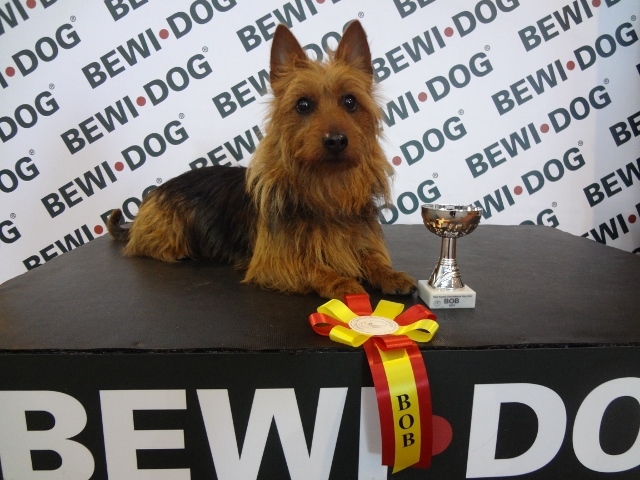 Both days Bluepepper`s Doc „Rafa“ was BOB Puppy with special prize and excellent critiques from 3 different judges. Thank you Marjo! Lot of thanks to the judges, owners, co-owners, handlers and helpers! Tänan kõiki osalisi: Rita, Anneli, Ingrid, Marjo, Katrin, Kristiina! Great thank you to the judges, co-owners, owners, handlers and all involved! Tänan teid: Rita, Anneli, Ingrid, Kristiina, Livia, Katrin, Maarja, Carolina and Missy Kasvataja Anne! Terjeripäev annab erinevate terjeritõugude kasvatajatele ja omanikele võimaluse meeleolukalt ja vabas vormis tutvustada huvilistele oma koeri. Üritusele lisavad särtsu lõbusad võistlusmängud, asjatundlikku nõu jagavad veterinaar ja koerakoolitaja. Arendavaid lemmiklooma mänge tutvustab „Nutikas Lemmik“, oma tooteid pakuvad „Norna“ ja „Pet City Kliinik“. Oodatud on kõik koerasõbrad! Terjeripäeval löövad kaasa „Norna“, „Nutikas Lemmik“, „Koerus“, „Pet City Kliinik“, koolitaja Sirje Vets, Caramira. Thank you to the judges Helen Tonkson-Koit and Siret Lepasaar! Tänud kaasomanikele Ritale ja Ingridile. Suur tänu reisikaaslasele Margotile piltide eest! Truozzy`s Hand in Hand „Missy“ Latvian Veteran Winner 16, BOB Veteran and BOB! - handled by Margot Oder, breeder Anne Moilanen. Congratulations and thank you to handler and breeder. Armirelli Too Hot To Handle "Tuuli" ex 2. 11.-12.06. 2 National Shows in Palanga, Lithuania. Armirelli Hot Date „Janis“ 2 CAC shows in Palanga: BOB x 2 under judges Nina Karlsdotter (Sweden) and Hans Almgren (Sweden) BIG 5! Became LT & BALT CH! 12.06. Agility AO placement 2! Owner and handler Ingrid Sats. Congratulations and thank you! Armirelli Funny For Money „Hupi“ BM CC BOB and became FI CH! 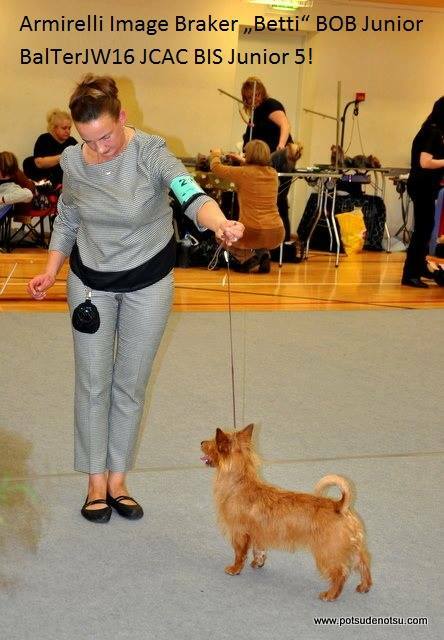 Owner / handler Pirkko Oinonen. Congratulations! Unfortunately I could not present my dogs this time myself, great thank you for excellent handling to Margot, Rita, Oksana, Ingrid, Mare. Lot of thanks to the judge for super critiques! Congratulations to owners and co-owners! 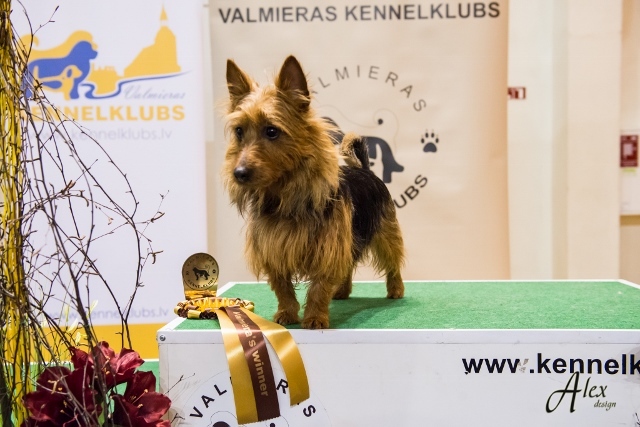 Armirelli Hot Date "Janis" CAC BOB and became Estonian and Latvian Champion. 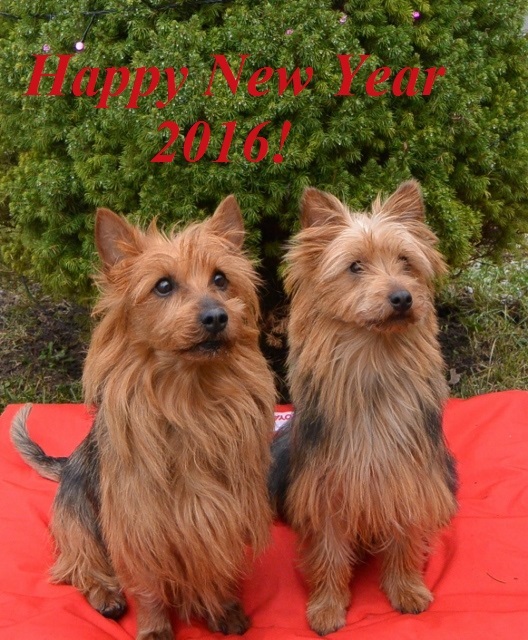 Congratulations and thank you to owner/handler Ingrid Sats! Armirelli Ever So Cute "Tralla" CAC CACIB BOS FICH! Armirelli Too Hot To Handle "Tuuli" Res- CACIB - turns inti CACIB! Judge Marko Lepasaar, Estonia. Thank you to the judge, co-owners, trip companions! Armirelli Hot Date "Janis" Best Of Breed! Judged by Natalya Milovanova.Congratulations and thank you to owner Ingrid! Armirelli Special Jape "Juula" BOB puppy at age 6 months. Armirelli Goodfella ex, op cl 1. Armirelli Too Hot To Handle "Tuuli" int. cl ex, BB3, res-CACIB. Armirelli Hot Date "Janis" ex, op cl 2. Armirelli Image Braker "Betti" jun cl good result. Judge Dina Korna. Armirelli Hot Date "Janis" both days BOB, "ValmieraW16" under judges Vesa Lehtonen (Finland) and Livija Zizevske(Lithuania). Thank you to owner Ingrid Sats for excellent handling and congratulations! PALJU ÕNNE! Truozzy`s Hand In Hand „Missy“ BOB, VetBOB, BalTerVW16, BIS 3 and BIS Veteran! Armirelli Image Braker „Betti“ BOB Junior, BalTerJW16, JCAC BIS Junior 5! Armirelli Hot Date „Janis“ CAC, BalTerW16! - shown by owner Ingrid Sats, congratulations! Armirelli Special Jape „Juula“ BOB baby-puppy, BIS baby 5! 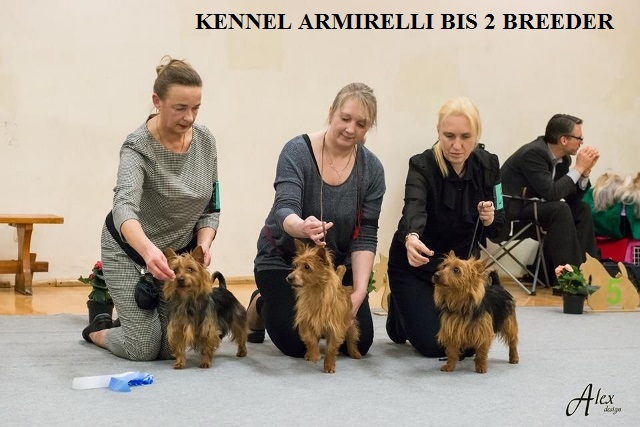 ARMIRELLI BOB Breeder & BIS Breeder 2! Thank you to judge Ligita Zake from Latvia! Great thanks to owners, handlers, helpers! Thank you to Margot for photos! 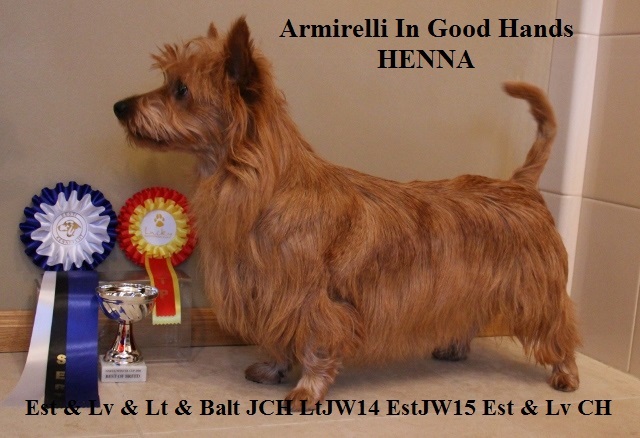 Armirelli In Good Hands "Henna" CAC and BOB ESTCH LVCH Armirelli Image Braker "Betti" VG. 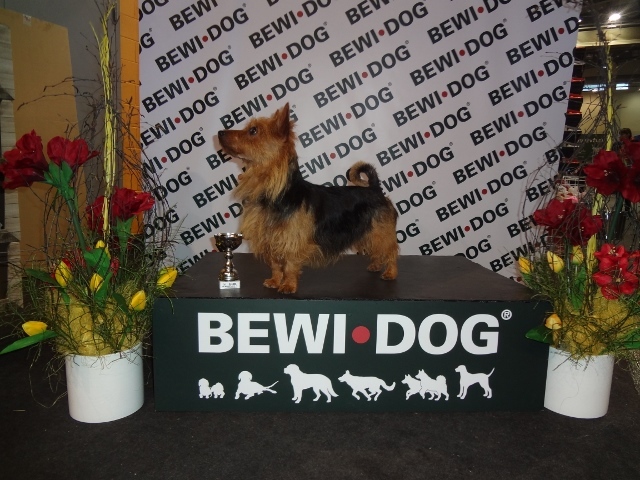 Henna became a new Estonian and Latvian Champion! Thank you to Margot for handling. Thanks and congrats to co-owner Rita! Truozzy`s Hand In Hand "Missy" BOB veteran, BB2 and BIS 3 veteran! Armirelli Image Braker "Betti" BOB junior, JCAC, BB4!